Of the hundreds of species of grains, wheat is the most common in the American diet. Wheat and its flour are used to make bread, buns, pasta, bagels, cookies, cakes, muffins, croissants, crackers, breakfast cereals and granola bars, just to name a few examples. Grains were not part of the traditional human diet during the evolution of our hunter-gatherer ancestors, and some researchers, including Dr. Loren Cordain, professor at the Colorado State University, believe that grains contribute to the chronic diseases that are now so prevalent in Western societies, as explained in a paper published in 1999 in "World Review of Nutrition and Dietetics." Wheat can have a negative effect for people who are sensitive to gluten, a protein found not only in wheat, but also in rye, barley and cross-contaminated oats. According to the University of Maryland Center for Celiac Research, about 1 percent of Americans have celiac disease, characterized by abdominal cramping, bloating, diarrhea, constipation and weight loss, while another 6 percent have a gluten intolerance, which can induce headaches, tingling in the extremities, brain fog, weight gain and symptoms similar to the irritable bowel syndrome. Both conditions are treated by the strict avoidance of wheat and gluten. If you are celiac or gluten intolerant, carefully read all food labels to ensure you do not include any traces of wheat or gluten in your diet. Most cereal grains, including wheat, contain a biochemical compound called lectin. Lectins are naturally produced by many plants like wheat to protect them against their enemies. A research done with pigs showed that a diet rich in grains and lectins was associated with insulin resistance, higher blood pressure and higher inflammation levels, as measured with the C-reactive protein, as published in the December 2005 issue of "BMC Endocrine Disorders." The authors of this study believe that a diet rich in lectin-containing grains, which include wheat, could increase hunger by inducing leptin resistance, which would explain the increased prevalence of overweight and obesity in Western societies. Some common autoimmune conditions, including rheumatoid arthritis and inflammatory bowel disease, may be linked to wheat and cereal grain consumption, according to a 1999 paper published in "World Review of Nutrition and Dietetics." Although more research is needed, you could try eliminating wheat and grains from your diet if you suffer from an autoimmune condition to see whether you notice any improvements in your symptoms. Consult with your doctor before changing your diet. If you have insulin resistance, metabolic syndrome, prediabetes or diabetes, eating too many carbohydrates at once can create a sharp rise in your blood sugar levels. 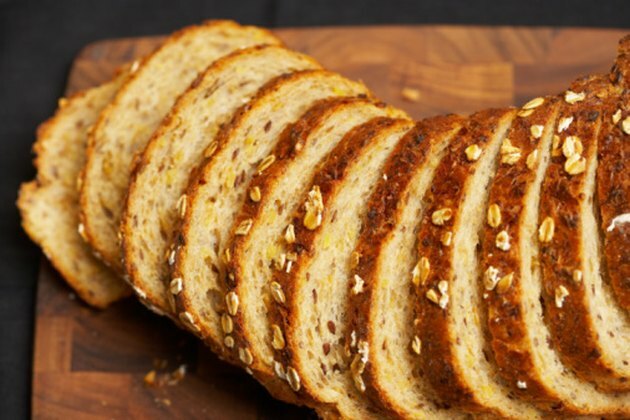 Many wheat-based foods have a high carb content. The American Diabetes Association recommends limiting your carbs to no more than 45 to 60 g per meal, but eating a bowl of 2 cups of wheat pasta with a tomato-based sauce and two small cookies made with wheat flour could provide well over 100 g of carbohydrates. A 12-inch sub made with white or whole wheat flour contains about 95 g of carbohydrates, without considering the additional carbs from the potato chips or soft drink. If you feel like wheat is causing you some problems, try eliminating it from your diet for a month or two. This challenge may be difficult to do during the first weeks because so many staple foods are made with wheat. For breakfast, try a quinoa porridge with plain yogurt, fresh fruits and nuts or have scrambled eggs with spinach, mushrooms and cheese. For lunch, you can have a sandwich made with sourdough bread or simply have a big salad of leafy greens with chicken, avocado, bacon and an olive oil-based vinaigrette. For dinner, serve your serving of protein with oven-baked sweet potato fries drizzled with olive oil. Talk to your doctor first. Is Quinoa Allowed on a Paleo Diet?